Here’s the blue scraps to go with the green scraps of two weeks ago. 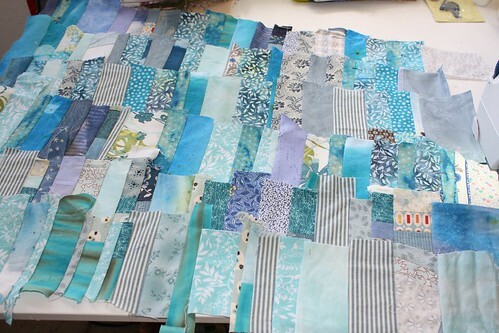 I had lots of darker blue scraps too, but they are being dispatched in another project. The turquoise scraps still fill my little bin, but at least they have some room to breathe now. And while you are enjoying the Long Beach show, be sure to also see “Beneath The Surface” featuring quilts by my Twelve by Twelve friends Gerrie, Deborah, Karen and sorry, I was remiss and forgot to add her — Terry. I’ve got two projects that require me to dye some fabric and batting (thanks to Judy Coates Perez for introducing us to the possibilities of dying batting — what I have in mind should be perfect for it). I checked my supplies, and since I don’t need specific colors, I found that I had enough on hand. Of course two of the colors were Procion and two were RIT. Oh, one of my batting pieces was wool, which accepts dye differently. Yesterday we didn’t really have anything going on, so I figured I could wrap my head around a bunch of little batches of varying processes. First I mixed up a batch of deep red Procion dye using 2 tsp Fire Red and 2 tsp Rust Brown. 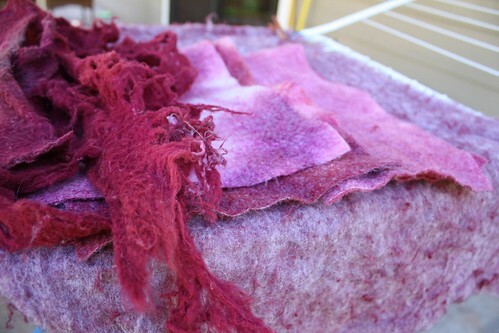 I used some of it to dye Quilter’s Dream Wool batting per Dharma Trading Company’s instructions. I used the rest of it to dye what I think is Hobbs Heirloom (a blend of cotton and poly with a denser feel than Quilter’s Dream) and Quilter’s Dream Cotton batting in the conventional manner with dye, soda ash, and salt. Left in the sun 1.5 hours. It was an experiment in fibers. 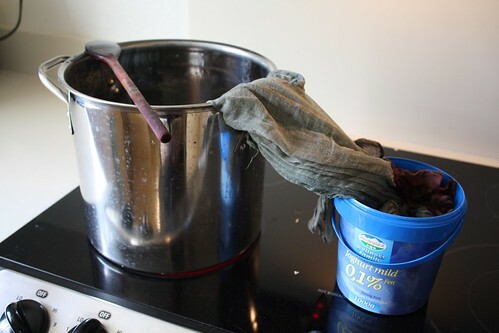 Left to right: the 100% cotton batting (unfortunately destroyed by the final washout in my washing machine, but took the dye very well); Cotton/poly blend — very mottled in the first piece where I had very little dye in the bucket, overall heathered look in the second piece where I had adequate dye in the bucket; underneath it all is the wool batting fixed with vinegar instead of soda ash — the wool took the dye well, but it’s scrim did not, and unfortunately most of the wool washed away into tiny bits in the final washout. Word to the wise: hand wash dyed batting! 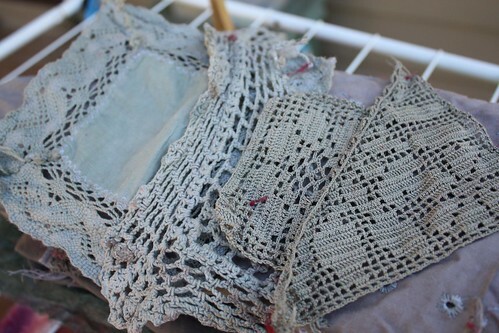 Simultaneously, I dyed some cotton gauze and bits of lace (some previously dyed) in Procion Pearl Grey (only 1.5 tsp as that’s all I had left) in the conventional manner. It all dyed just fine, but was a nondescript very light grey. So, I overdyed it figuring that if it was completely covered that was OK, but if bits showed through that was OK too. I used RIT dye sort of following their stovetop method. I wanted the look of the low water immersion method, but I didn’t want to use my kitchen microwave (which really belongs to my landlord and is rather upscale). I have dedicated pots for dyes and felt more comfortable using them. 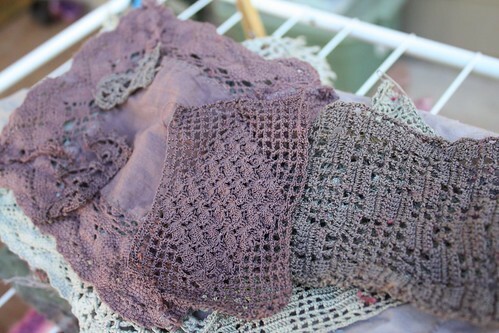 I had this piece in two pots on the stove at once, and then overdyed just one end later in a third pot (first photo). From left to right I used, RIT navy blue and sunshine yellow; RIT taupe and dark green; Procion pearl gray (which is actually under all the other colors too); and RIT taupe, teal, and dark brown. This is what else was in the taupe and dark green pot. This is what else was in the taupe and teal pot that I thought was too green so I added brown, but I added too much, so it’s just brown. The last batch was overdyed with RIT dye also using the stovetop method and 1 tsp Navy Blue + 1 tsp Sunshine Orange and a lot more water than the first two batches. Most of the fabrics were cotton or a cotton blend. 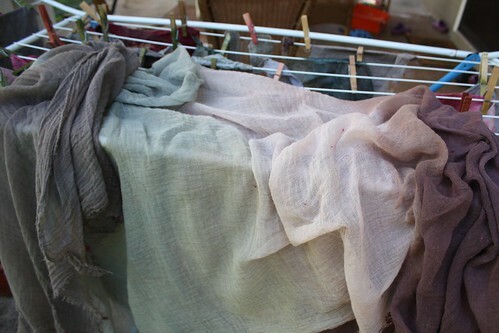 However, the far right is Lutradur (a kind of interfacing) that accepted the dye completely differently. Interesting. Despite the batting blowout and the seemingly blah colors, I am very happy. My concept for the batting is to use it where something is being cut away in a raw sort of way, so the batting looking like viscera isn’t an entirely bad thing. The other project needs stone colors, so I think that the muted grey, green, and browns are just perfect. Since I sorted all my scraps (and have been pretty good about putting new ones in the appropriate bins) I have also been slowly sewing the scraps to paper foundations. “String” quilts made from these sort of aggregate bits are pretty popular these days, and I have always been a fan of the scrappy look. I started with green because I have a plan that uses greens, blues, and yellows. I am happy to report that my green bin is nearly empty! Now I will chip away at the blue bin. Last spring I taught a sampler quilt class at my local park (Ho’ae’ae Park). In August I will hopefully teach another beginner class. This time I’m thinking that small projects featuring many of the same skills will work as well and give students a better chance at finishing them. To that end, I’ve been making up class samples to show off at the park office. 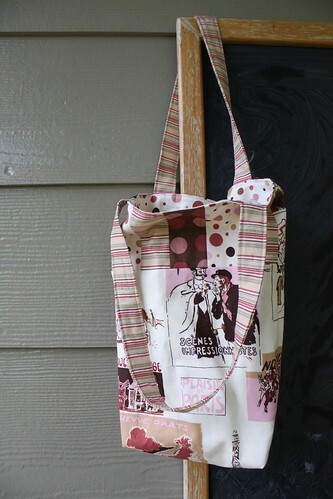 First will be a small lined tote, perfect for a Hostess gift. It can be made from four fat quarters (that are always so tempting at the fabric store, and often already bundled in nice color combos). Students will learn basic rotary cutting skills and strip piece fabrics to make the patched “piano keys” strip at the top of the bag. 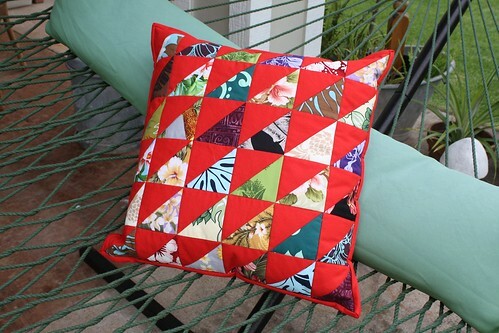 Next we’d move on to an easy way to piece triangles and make this quilted pillow cover. 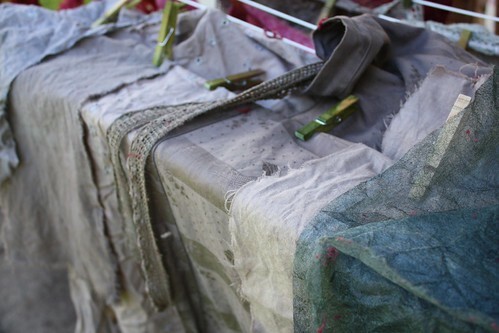 If students have a pile of scraps, just one solid can pull them together — or the pillow would look great in two colors. In addition to making triangles, this is a good size project to practice machine quilting on, and the edge is bound just like a large quilt. Finally, we’ll make my “signature” project, the Mod Log Table Runner. 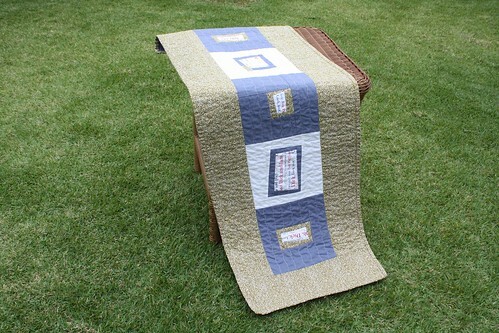 I love log cabin blocks and think that because of their versatility, every quilter needs to have at least a little experience recognizing and making them. 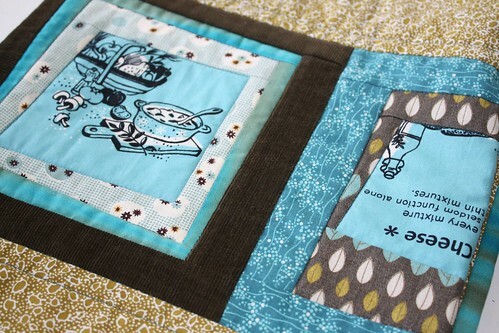 This project needn’t be super accurate until the borders are added, and reinforces those quilting and binding skills. So, if you or anyone you know is on the Central to Leeward side of Oahu and would like to learn to make these projects, keep your eyes open for the Parks and Recreation schedule in August. I’ve had the most confounding experience (stitch-wise) the last few days. I am planning on teaching a beginning quilting class at my local park again in August. 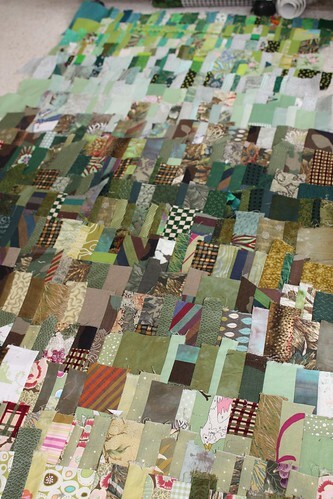 This time, instead of a sampler quilt, we’re going to make three smaller projects. I’m making class samples now. While in Spokane, WA for my MIL’s wedding (congratulations lovebirds! 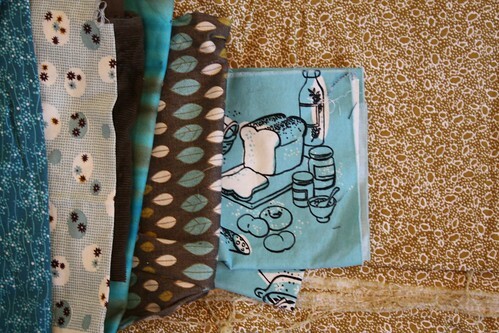 ), I bought some really ugly fabric that was on sale and screamed for me to take it home and make it sing. Aqua was all it needed. Then I tried grey and white in an uncharacteristic moment of fashionable-ness. I liked both, so I sewed up two table runner tops. No problem. 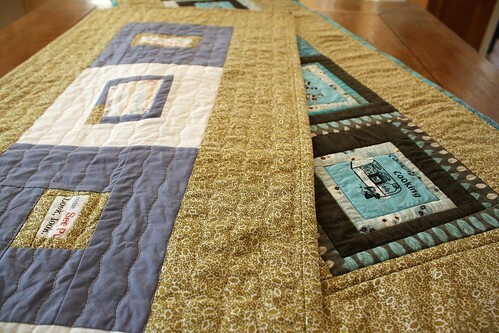 But when it came time to quilt the first runner, the thread broke. This surprised me because I was using a “golden retriever” thread (a term coined by Superior Thread Bar Tender Cindy for threads that are very easy to use) and quilting in straight lines. I adjusted all my tension options to no avail. Then I changed to a fresher topstitch needle. Nope. I changed spools of thread, and it broke too (so it wasn’t a bad spool). I changed to a smaller, sharper microtex needle. Nope. Then I put in a brand spanking new topstitch (easy on the thread) needle and still the thread broke. I switched to a different type of thread and it broke too. All the while, I was noticing that the needle seemed to be struggling to get through the ugly fabric. I admitted defeat and picked out all my stitching attempts. I figured that the ugly fabric must have been on sale for more than just it’s aesthetic value and re-sandwiched my table runner top with a different backing (since I had so much ugly fabric, and I thought it was so bad it was cool, I used it front and back). I tried stitching the table runner in cross-wise straight lines, but even with the new backing, the thread broke. 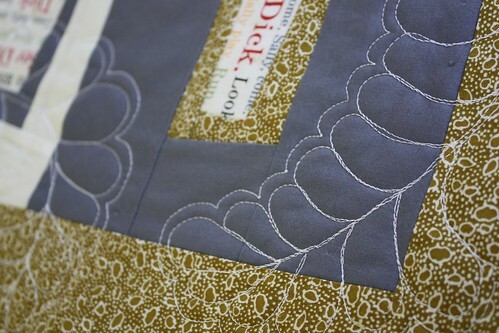 Then, I only stitched on the non-ugly fabric parts — and it worked! I got brave and did a little stitching on the borders (ugly fabric) where I could take it out and it would still look OK. It worked and I didn’t have t remove any stitches! One table runner done. After sleeping on my fabric problem, I had the brilliant idea to put a new back on table runner two and stitch it from the back, hopefully avoiding, in a way, the problematic ugly fabric. I had hoped to stitch in the ditch of my wonky log cabins, extending the lines out into the border, but that wouldn’t work from the back where there’s no lines to follow. Serpentine stitch is quite popular right now, and would look good with the simple piecing, but I really wanted to do something different. Since I was working from the back and couldn’t follow what was going on on the front, I figured I could take that all the way and do something completely in contrast to the piecing. I decided that since the piecing is tweaked traditional, the quilting should be too — simple feathers in a loose arrangement. I had no problems sewing the feathers, but since I’m not a great machine quilter, and my arcs were pretty large, I just wasn’t happy with them. So, I picked them out. Again, I admitted defeat, and opted for the serpentine stitch. I wanted to make sure it was oriented relatively straight on the table runner though. I crossed my fingers and hoped that I could stitch one line from the front and then align the rest off that from the back. Guess what? No problem! So I sewed the next line on the front. No problem. So I completed table runner number two without further incident. In the end, I have no idea what was making my thread break. Perhaps it was that two layers of ugly fabric was too much. I considered that it was the batting, but Runner 1 used scraps from a batting I had used successfully on another quilt, and Runner 2 used a completely different batting (which I don’t like, but not for stitchability issues). Perhaps it was some magical combination of the fabric and the angle at which I was stitching it (straight was bad, serpentine or free-motion met the fabric in an acceptable way). Perhaps it was the alignment of the planets and by day two things were back to normal. I don’t know. 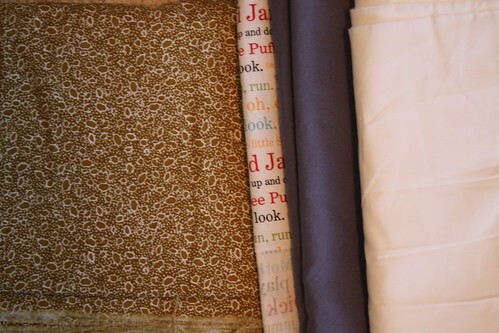 I do know that I won’t be using the ugly fabric for my other two class samples which are next on my to-do list. Last weekend was Quilt Hawai’i on the Big Island. Many, many, months ago I heard that the Superior Threads people would be holding their School of Threadology there and so, of course, I had to sign up. I even convinced three other friends from the quilt guild to join me. We were so happy we went. We arrived early (really, really early) on Wednesday because Rowena had a morning class. Susan and Debby opted to help the organizers set up, and I escaped to the beach with local Flickr friend Anika! She took me to Waialea Bay (AKA Beach 69) where we chatted, snacked, and swam a bit. This being in Hawai’i stuff is rough, but someone’s gotta do it. Thursday was all about thread. In the morning, Dr. Bob, professor of Threadology, gave a lecture on thread composition, uses of various threads, needle types, sewing machine issues, and pretty much everything you ever needed to know about using thread in a quilt but never thought to ask. Class included a huge goodie bag of Superior threads and needles, and a book with all the information covered plus handy dandy charts. Then, after lunch, it was play time with Annie. We used this cool product called Texture Magic. Basically, you stitch your fabric to the Texture Magic sheet (and using cool threads adds to the fun) and then steam it to shrink the Texture Magic, thus crinkling your fabric. We used our crinkly fabric to make cute handbags. After class, Susan had arranged for the four of us, plus three other Guild ladies who happened to also be there, to visit Quilt Passions, a lovely quilt shop in nearby Kona. Karen, the owner, is doing a wonderful job with the shop. She’s got patterns from local designers and lots of classes. They specialize in batik fabric, but have a nice selection of other things to choose from as well. They’ve even got their very own fabric (which she’s cutting for Rowena here)! Not only did Quilt Passions have a booth at Quilt Hawai’i, but they offered to shuttle people down to the shop and even included a small dinner for our group. Definitely making the most of opportunities both for the shop and for us visitors. Kudos. Friday was Open Thread Bar. We had the whole day to play with all the lines of Superior threads. This was a great opportunity to get expert help troubleshooting any issues with our machines and the tricky threads. It was also great to try in person the threads I had only seen online. Mother Superior showed us a nice couching combination with an uneven zigzag stitch and Razzle Dazzle thread. Our Bartender Cindy was great with tips on adjusting our machines and the best uses for each thread. I never thought I would be stitching feathers with metallic threads, but I did — and I liked it! Thursday night was Quilt Hawai’i’s fantastic Fabric Bingo, where I won an amazing amount of swag. Friday was Superior quilt show and tell (I’m ready to make a whole cloth quilt in dupioni silk now), a project with fusible thread, and then graduation with highly coveted, much sought after, certificates. My friends and I are now a Certified Superior Threadologists! I missed the big reveal while I was away for the weekend attending Quilt Hawaii, but it’s never too late to check out the latest Twelve by Twelve quilts on our blog. Come on over with me to see what we have done with teh complimentary colors yellow and purple.